The herds of the West have been conditioned to react to the word “colonisation” with horror and guilt. From the late 1400s until the European empires were wound down after World War II, ghastly crimes were indeed committed by colonial invaders against the native peoples, all over the world. But what this focus on historical crimes overlooks is that these same crimes are still being committed, by the ruling classes against the middle and working ones, to this very day. In 1860, shortly before the American Civil War, the total slave population in the United States stood at 3,953,761, or 12.6% of the total population. In the Gulag system at its height under Stalin, there were believed to have been up to 6 million people incarcerated. Most people agree that slavery and Communism were two of history’s greatest evils. But in 2013, there were 6,899,000 Americans under correctional supervision (probation, parole, jail, or prison) – about 2.8% of the total population. Although smaller as a percentage of the national population, in absolute terms it still represents a greater number of unfree people than under either slavery or Communism. In fact, it amounts to about 25% of the world’s population of prisoners, and not all of them are in there because of murders, rapes and armed robberies. Far from it. Because of the War on Drugs, the population of non-violent drug offenders in American state or federal prisons has increased twelvefold since 1980. The same strategies that the colonial powers used to subjugate their client populations are being used today to subjugate the peoples who are still their client populations – only instead of being done to dark-skinned races by lighter-skinned ones, it’s done to the working and middle classes by the ruling ones. Today’s system of convict labour achieves almost everything that was seen as desirable in a slavery system anyway. Some refer to this as the ‘prison-industrial complex‘, because the profit incentive seems to have led to people being imprisoned for the benefit of shareholders in private prisons. 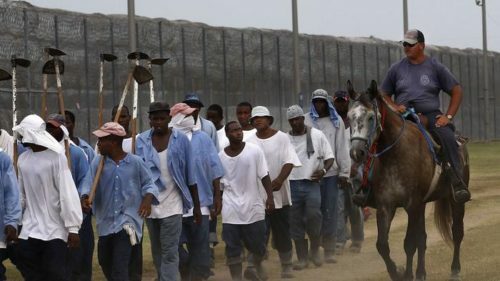 These prisoners are often paid less than 20c an hour for their labour, despite that their productivity is dozens of times higher. So the mentality behind the great colonial enterprises of enslaving millions and extracting resources from them in the form of labour not only still exists but it still manages to enforce its will in the 21st century West. The only difference is that, this time, the people are enslaved through the prison-industrial complex, and mostly for arbitrary drug offences. Some groups are hit harder than others by this approach. Black people are imprisoned at the rate of 2,306 per 100,000 people, which means almost 1 in every 40 American blacks are in prison at any one point in time, and for black males the rate is an incredible 4,347 per 100,000 people, about 1 in 21. The mentally ill also suffer atrociously in American prisons, regularly being subjected to corporal punishment for reasons related to their condition, such as becoming confused or anxious or having difficulty following instructions. The truth is this: the ruling classes only recognise each other as true human beings, and all lower classes are considered some kind of animal to be exploited. Emphasising the racial aspect of the crimes of colonialism, as is common today, only serves to shift the blame from the ruling classes who planned and designed it to the middle and working classes who were forced to help carry it out lest they become the next group of victims. Colonisation was never a matter of race, and it didn’t stop happening after the European empires fell. It was always a matter of class, and it simply shifted from being done to them over there to being done to us over here. Next Next post: Does Cannabis Prohibition Cause Schizophrenia?